Fish Recipes - Seafood Recipes, Indian Fish Curry, Salmon recipes and more. Fish Recipes/Seafood Recipes are one of the most healthiest and liked recipes throughout the world. Fish contain many nutrients, including protein, hence they should be included in our diet at least thrice a week. A small portion of fish provides with a third and a half protein required each day. Most fish are also rich in vitamin b12, which is required for a healthy nervous system. Fish are a good source of iodine as well. Fish fat is unsaturated and hence the fish oils are highly beneficial. Fish contains omega-3 fatty acids which help to protect against heart and circulation problems. They are known to reduce the risk of thrombosis and increase blood flow in small vessles. This is thought to be one of the major causes of reduced risk for cardiovascular diseases in Eskimos. Studies have been conducted that suggest that people who consume more fish and seafood in their diet live longer, for example the Japanese. Fish is also good for the skin. 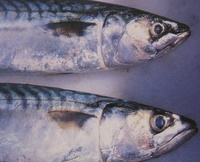 sardines, herring and tuna), contains Omega 3 fatty acids. Some Shellfish (shrimps, prawns, crayfish) although high in dietary cholesterol, are very low in fat, so the cholesterol is poorly absorbed from these. Studies have shown that clams, oysters, crab and mussels, tend to lower certain type of blood fat, reducing the overall blood cholesterol. Shellfish is also rich in Selenium (an essential mineral required by the body to fight against free radicals and protect against cancer and heart disease). The best (healthiest) way to eat fish is to grill, steam or bake. Frying, increases the calories by four times (although occasional frying, won't be a crime). I hope the following fish recipes and seafood recipes will fit your taste. Baked Fish / Steamed fish -Very aromatic oriental flavors. Seafood Paella Recipe - a Spanish classic. Seafood can be prepared in a variety of ways. It can be eaten raw (scallops, sashimi). It can be cured by marinating , pickling or smoking (smoked salmon). Or it can be cooked by baking, frying, grilling, poaching or steaming. In India fried fish and fish curry is the most popular fish recipes. Although the healthiest form of eating a fish is grilling, poaching or steaming. * Fish are the most common food to obstruct the airway and cause choking. * Fish products have been shown to contain varying amounts of heavy metals, particularly mercury and fat-soluble pollutants from water pollution. Certain seafood contains sufficient mercury to harm an unborn baby or young child's developing nervous system. * Raw fish may contain parasites and if it is consumed in that form may cause trouble. The raw fish should be frozen for at least a week, in order to eradicate the parasites. Cooked fish, however contains no parasites. * The fish should smell and look fresh. If it is smelling like ammonia or unpleasant, don't buy it. * Check the gills. They should be red and the scales should be shiny. * The fish should be firm and elastic. If you press it a little with your finger, you would know. * If buying separate steaks from a supermarket, please check if they are looking moist and lustrous. * When buying mussels, clams and oysters, the shells should be tightly closed. If the shell is open, tap on it a little, if the shellfish is alive, the shell will close immediately. In case it doesn't just throw it away as the fish inside is already dead. * Prawns should also feel firm and smell sea like. * If not cooking the fish the same day, it is best to freeze it. Clean the fish under tap water and put it in the freezer bag. Place this bag in another bag to prevent any leaks and deep freeze it. * Ask your fish vendor to clean (shell) the prawns for you. If not cooking the same day, de vein the prawns (i.e remove the vein from the back), wash under water and place in a freezer bag. * Crabs should not be stored in the freezer raw. If not cooking the same day, just boil the crabs and let it cool. Remove all the meat and freeze this meat if you want. * Most fish will freeze up to 2-3 months. * Let the fish defrost naturally before cooking. * Never ever freeze a defrosted fish again. Have you heard about the deadly Japanese delicacy - Fugu ? Fugu is the Japanese word for pufferfish and is also a Japanese dish prepared from the meat of pufferfish. This pufferfish is lethally poisonous and if prepared incorrectly, can be fatal. It is said that certain organs of this fish (ovary, roes and liver) has a toxin. If consumed, the victim gets paralyzed and may even die of lack of oxygen in the body. One wrong move of the knife during the preparation can cause a poison leak in the fish. Restaurants chef who are entrusted with fugu preparation must undergo a seven year apprenticeship. Despite this fugu remains the cause of fatal posing in Japan.